VINCE GIORDANO IN THE NY TIMES! A great article appears in today's NY Times celebrating Vince Giordano's gig at the Hotel Edison. Vince and the Nighthawks are quite simply the best at what they do, and it's great for them to receive due recognition in the Times. All club dates for the Nighthawks are conveniently found on Vince Giordano's MySpace profile. “I’ve gone through many, many musicians to find a group who really interprets the stuff the correct way — it’s almost like trying to find someone who’s speaking a certain language,” said Mr. Giordano. See an accompanying video here. "Rocky Mountain Blues" by the WEJB! This RADIOLA! is offered early as a treat for the long weekend (and beyond) to ease spirits and digestion. Featured are some tasty leftovers and a few covered dishes that haven't been presented before. Enjoy! This show is available on my Live365 station, and as a 128k download: HOUR 1 and HOUR 2. UPDATE: This show may now be downloaded in 128k mp3 format: HOUR 1, HOUR 2, and HOUR 3. Friday's RADIOLA! will be a three-hour internet special featuring my friend and neighbor Walt Mitchell playing and discussing his favorite recordings from over 50 years of collecting. The show will be uploaded on my Live365 station as soon as it is available, with links to 128k downloads posted on this site and on my Facebook profile, and sent to my whole email list. Once again, it's time for another break and so, as usual WHCL will be halting broadcast for the duration of the Thanksgiving break. We will stop on Thursday evening/early Friday morning, with the last show on air before break being "Get Lite with Prince and Em" with Anderson/Asada-Johnson on the Friday 12:00 to 1:00 a.m. slot. All shows following that, meaning all other shows on Friday the 20th will not be broadcasted. We will resume regular broadcasting on Monday, November 30th with the 11:00 a.m. slotted shot, "Run For It." Check this website for further developments, such as possible internet-only programs. RADIOLA! ON LIVE365 NOW IN 32K STEREO! I'm in the process of upgrading the sound quality of my Live365 station--which entails reloading all the programs that were on the 24K playlist. It will take a few days to get all the programs back up on the stream, but it's up and running. The 32K audio should be markedly better, while still being friendly to slower internet connections. Please let me know in the comments section below--or by email--if there are any problems with your reception of the upgraded stream. Above all, I hope it makes the experience of listening to RADIOLA! somewhat more enjoyable. UPDATE: This show is currently available as a 128k download: HOUR 1 and HOUR 2. This RADIOLA! is dedicated non-specifically, if that's possible. Tune in Friday at 8 PM Eastern to WHCL (with direct streaming here). I'll upload it to my Live365 station this weekend. This is truly sad. After being discouraged from playing Pre-War British Dance Bands on his program--and subsequently being forced out of his long-term radio spot--BBC Radio 2 presenter Malcolm Laycock died Sunday. Play some good old British Dance and raise a pint to his memory. 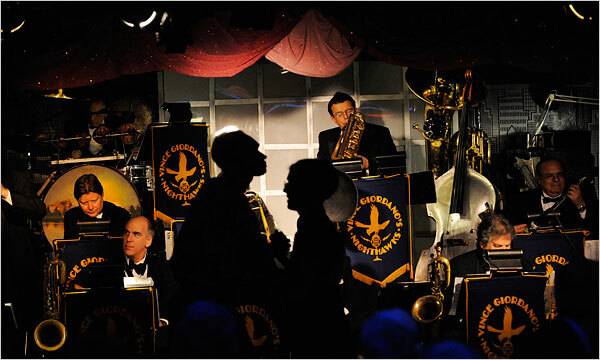 I'll soon post the British Dance Band show I did last December in 128k mp3 format. UPDATE: Download "London Calling" (Dec. 5, 2008) in 128k format here: HOUR 1, HOUR 2, and HOUR 3. UPDATE: This program is now available as a 128k download for a limited time: HOUR 1 and HOUR 2. This RADIOLA! 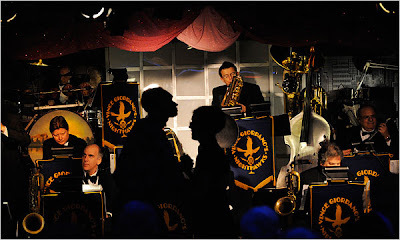 is a celebration of our recent weekend in Chicago to hear Vince Giordano's Chicago Nighthawks and The West End Jazz Band. My wife and I heard the most excellent jazz and met truly wonderful people (even some listeners!) during our all-too brief stay. Many thanks to the astoundingly gifted musicians we enjoyed, the Illiana Jazz Club for hosting Vince with his group of (mostly) Chicago jazz greats, and all others who made our visit worth repeating--and we will be back! Tune in tomorrow at 8 PM Eastern (7 Central) to WHCL (with additional direct streaming here). The show will be uploaded to my Live365 station this weekend.